When I look for makeup, I want it to be as natural as possible on my very sensitive skin. I try to stay as cruelty free as possible, but my skin doesn't always agree with the products that I have tried. 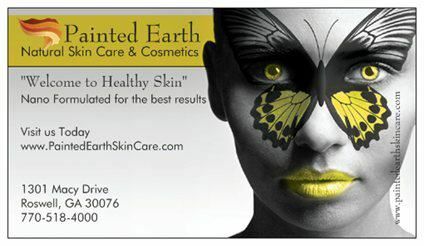 Fortunately, this new found gem, Painted Earth Skin Care, has agreed with my skin impeccably. I found no irritation upon application of anything and that is rare. Especially with Mascara. When choosing makeup, I usually go for very earthy colors in different mediums. I love a variety in my face pallet, because I tend to get bored easily! Though on the same spectrum, I tend to excite easily when I find what I really like. Painted Earth has fulfilled this need in so many ways and it has been an absolute pleasure to try out a wide selection of their makeup and skin care. 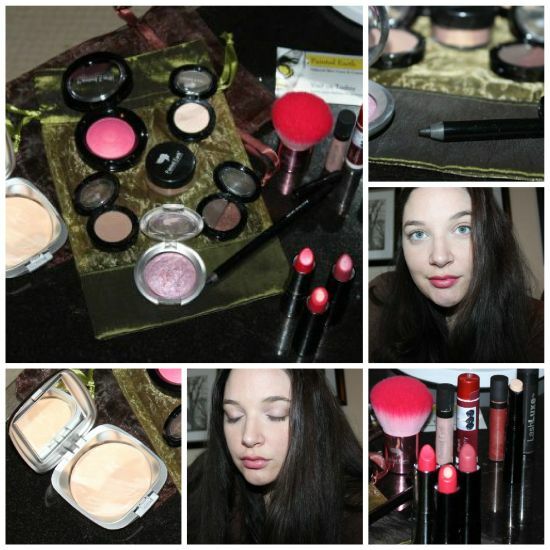 Today, I cover their cosmetics, with a few looks. Later, I will cover the skin care I am trying out. Before I go into the looks, i'll give you a background of Painted Earth and what they offer. As I said, Painted Earth is 100% cruelty free and makes sure that all their ingredients are healthy to wear. Most of the ingredients are hypoallergenic and paraben free, but every product clearly states whether it is or not and EXACTLY what it has. They even have an ingredient dictionary! I love that they provide this so I don't have to go all over google and search for it for 3 hours. Pink dyed Kabuki brush- So incredibly soft to the touch! I think it is actually the softest brush I have owned. I couldn't stop swooshing it again my cheeks, because it felt so good. Mineral HD Concealer stick in Light-Said to give you a camera ready finish with skin optic light technology that delivers light light reflective and camouflaging power. Great for dark circles and fine lines. I used this on my dark circles. It has a yellow tint which is perfect for the under eyes. I can vouch that this definitely disguised them well. Duo eye shadow in Chocolate Spice- A matte chocolate and a very fine glitter infused dark chocolate brown to complement. 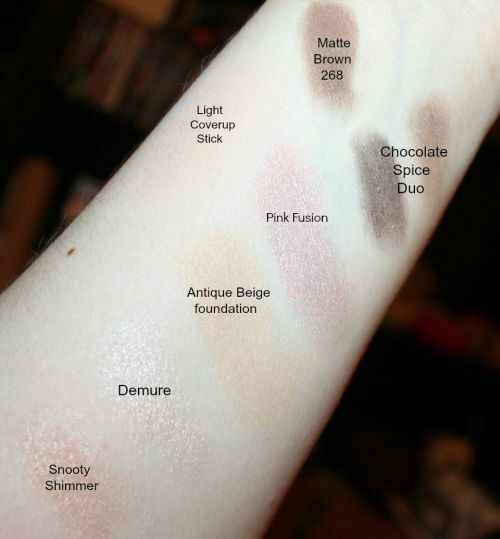 All the eye shadows are very pigmented and go on so smooth, as you'll see below. Polychromatic Shadow in Demure- A mineral shadow with metallic and pearl pigments that create high shine and light reflection. This makes such a pretty highlighter! Matte Shadow in a brown #268-A nice plain matte color perfect as a base or alone. Baked Mineral Eye Fusion Shadow in Pink Fusion- This stuff is so incredibly gorgeous! It is like a mauve purple pink fusion of shine. I absolutely love the color. It contains the antioxidants green tea extract, jojoba seed oil and vitamin e that also give it such a smooth application. Baked Mineral Foundation, Perfect every Thyme. In Antique Beige- This color was too dark for my skin, but it was great as a base for eye shadow. It is said to have anti-aging benefits, with a light reflecting technology, minimizing the appearance of pores and lines, while giving a "no-makeup" finish. Infused with many antioxidants and good for you ingredients: Jojoba, Safflower, Lavandula, Thyme, Green Tea, Vitamin E, Rosemary, Magnolia bark extract. 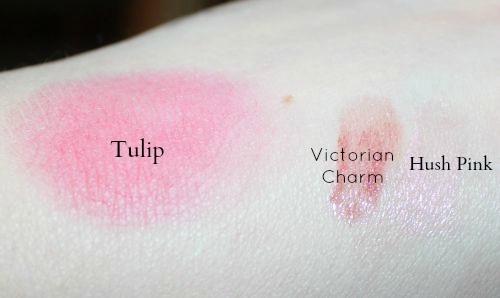 2 Lip glosses with mint flavor, in the color's Victorian Charm & Hush Pink-Incredible shine and moisture. I like the slight tingle from the mint. Baked Blush in Tulip-Such a gorgeous and vibrant pink that you can go subtle or very bright with. Luxury Matte lipstick in Grace- This matte is not, I repeat NOT drying! Very emollient and creamy, yet still matte. It is said that the ingredients make application perfect and prevent drying, but ensure long lasting color stay. Infused with Sodium Hyaluronic, Squalene and Vitamin E. Hypoallergenic and free of preservatives and fragrance. Transforming lipstick in Petal Pink- A bright vibrant pink in an age defying formula with amazing hydration. It is said to repair dry cracked lips and make them smooth over time. It feels very emollient, I can tell it backs it's claim. Take a gander at my lippie swatches down below and you'll see how amazingly moisturizing they are. Mineral Core Lip Tint in Berry- A really nice true to the name color, with a moisturizing center and full sun protection with SPF 15. Black Cherry lip balm (No tint)- This smells divine! I could not stop sniffing it, and it tastes as good as it smells. I am a balm addict and i'm one of those that loves it to tickle both my senses. I applied this before bed and woke up with such soft lips. It contains my favorite oils: Sweet almond, coconut and avocado. This is my new go to balm right now. Love it! Avocado oil is actually a natural light SPF as well. Lash Luxe Mascara-Does not irritate my eyes! It is said to give you thick, long lashes and it really did just that. Super Wear Gel eye liner in Noir 01- This gives a smooth smudge proof application, with lots of shine an packed with moisturizing Vitamin E and Jojoba oil. This liner gave me a flawless, very smooth application. I am hooked on Gel liners! The gel eye liner went on very smooth and flawless. I put it on thick at an angle, but you can easily achieve a thin line as well. It smudges rather nicely too. I found another amazing eyeliner! Gone are the days of rough and sticky pencil liners! I am beginning to become quite obsessed with gel liners. They go on so nicely and mistakes are easily wiped away, with a q-tip and makeup remover. For the first look I went for subtle pink and browns. I lined my lids with the chocolate. 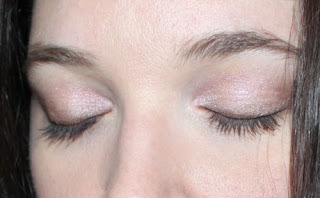 Then blended in the Pink Fusion and darker brown from the outer crease into the pink. I complemented this with the matte pink lipstick in Grace, along with Tulip baked blush. Lastly, I applied their wonderful Lash Luxe Mascara. For the other look, I used their Transforming lipstick in Petal Pink and I kept everything else pretty simple with a light sweep of Antique Beige foundation as the eye shadow base and Demure as the highlighter. When I have bright lips, I like to keep everything else basic. I can't really express enough how impressed I am with everything I received. 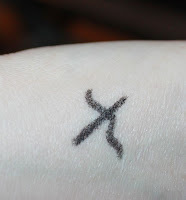 The shadows are all very pigmented, go on so smooth and what I wore lasted all day. I love that I have so many shades of pink to choose from now and the lippies have great lasting power. I reapply out of habit, but after a few hours of eating it hasn't worn off much. Does it get better than this? Well, yes. Why? Painted Earth isn't a store that is limited to cosmetics and skin care, they also carry jewelry and even pet care. Something really cool though, is their re-purposed beerwax candles! I love anything having to do with recycled art and candles. So, I'm thinking it's not going to stop here and they're just getting started. I'm just getting started too, my next review will cover their skin care! If you'd like to learn more about this wonderful cosmetics company, you can follow them on Facebook, Twitter and Pinterest for updates and promotions. Also, they have makeup tips on their website. Check em out! The snooty shimmer would be wonderful on you. I think i'll use it as a light bronzer in the summer. All of those products are amazing. I love all the pink glosses. I love natural products! I am always looking for the best and it sounds like this is it! Wow, I love those colors! I'm an earth tones girl also! In the past, I've found that natural makeups lack color but those are great! Those cosmetics look really great on you and compliment your skin tone so well! I too have very sensitive skin and have a very hard time finding products I like in the entire world of beauty products: soaps, lotions, acne products (adult acne is cruel), and especially cosmetics. I have really been wanting to try out a gel eye liner. I have always ever used pencil liners, but they make my eyes burn after putting it on--and no, I don't poke myself in the eye! Ugh, It's embarrassing how much i've spent on acne medication and makeup that was supposed to be "non-comedgenic" I'm way past my 20's and still suffer major adult acne. I feel your pain. This definitely doesn't irritate me. Gel liner is amazing. It's so smooth. You have to try it! These products look great on you dear! I love Painted Earth! They have such great, quality products! Those lipsticks are fierce and I love the way they look on you! I for one am in love with the Perfect Thyme Foundation Powder- absolutely amazing!!! Great Review and love your looks! I can see how you would love the Perfect Thyme Foundation, it looks perfect for your tone! Love this, and the eyeshadow you did is really pretty and love the lip colors too!!! Might have to check them out when I am running low on makeup! Wow Brie! This is a great post. This makes me want to go out and get all of these products right now! Your skin looks flawless and I loved your swatches!! I picked up some of this recently as well and I totally agree!!! I love painted earth! I love those colors - I have similar skin tone so they would be great for me also. I have never tried gel liner... looks great! I adore all of those colors! Mostly subtle with just a hint of color is perfect for my skin tone. Having a product that is just perfect for my skin makes it even better. I'll definitely have to get myself a few. Thank you for the beautifully amazing review! I absolutely love those colors. I too try to stay with a natural looking pallet. I will check these out. Love the cruelty free. This is a new brand for me and I love how well you explained everything. I am a pink girl, too, and especially liked the lippies. Cruelty free is a must. Can't wait to hear your take on the skin care. This is the first I have heard of this brand, and I love that it works well with your sensitive skin, because mine is the same way! It is hard for me to find cosmetics that do not irritate my skin. I love how this uses natural ingredients, too! So many beautiful colors!